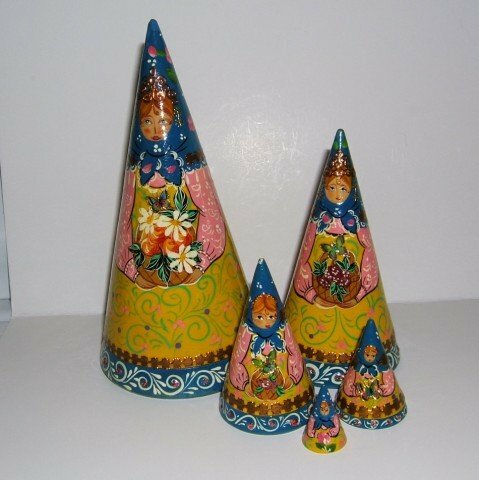 These lovely conical dolls are nicely painted with a lot of detailed vines and metallic filigree. They open at the base. The dolls have wavy brown hair, blue eyes and rosy cheeks. They wear yellow dresses decorated with green vines and pink berries, pink sleeves and dark blue conical scarves decorated with pink roses. Each doll carries a woven basket full of flowers. The dolls are decorated with metallic copper ribbon and sequins at their base, and scrolled copper wire veils on their foreheads. Each doll has a metallic rainbow colored butterfly decal on their basket of flowers. Each butterfly is the same size and becomes more prominent on each doll.